2. To make the fishless fingers, press the firm tofu to remove excess moisture. Drain the cashews, then pulse with the tofu, chick peas, garlic granules, seaweed and ½ tsp salt in a food processor until smooth but still with a little texture. Shape into 10 fingers (about 50g each), or 12 smaller ones, and set aside. 3. Using a fork, mix the flaxseed with 180ml cold water to make ‘flax egg’. Set aside to thicken. Put the gram flour on a large plate. Transfer the thickened flax egg to another large plate. Mix the breadcrumbs, turmeric and paprika and remaining salt together on a third plate. 4. Dip the fishless fingers in the flour to cover completely, then into the flax egg and finally into the breadcrumbs until evenly coated. Heat a nonstick frying pan over a high heat. Add 2 tbsp of sunflower or vegetable oil, reduce to a medium heat and cook the fingers in batches for 5-6 minutes until golden, turning occasionally. Add more oil as needed. Set aside on kitchen paper and keep warm. Return the pan to the heat, add the spinach, olive oil and a pinch of salt. Leave to wilt for 2-3 minutes. 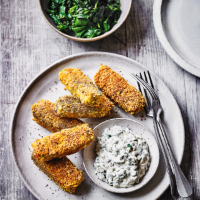 Serve immediately with the fishless fingers and tartare sauce. The fishless fingers freeze well either before cooking or after. Cook from frozen under a medium grill for 15 minutes, turning occasionally until golden and piping hot throughout.